One of the most highly accomplished public figures in America today, Former Attorney General Loretta Lynch has been a leading progressive voice during her 30+ year highly distinguished career. She is the first female African American Attorney General of the United States, appointed by President Barack Obama in 2015. She also served as the head of the U.S. Attorney's Office for the Eastern District of New York twice, under both President Clinton and President Obama. Described by President Obama as "the only lawyer in America who battles mobsters, drug lords and terrorists, and still has the reputation for being a charming ‘people person," she has been instrumental in shaping the direction of the nation on a number of tough issues. She improved the relationship between local law enforcement and the communities they serve, and she has taken bold stances on criminal justice reform. Lynch has spent years in the trenches rising through the ranks as a prosecutor, aggressively fighting terrorism, financial fraud and cybercrime -- all while vigorously defending civil and human rights. While leading the U.S. Attorney's Office for the Eastern District of New York, she became known for the high-profile civil rights conviction of two Brooklyn police officers who brutally assaulted Haitian immigrant Abner Louima. 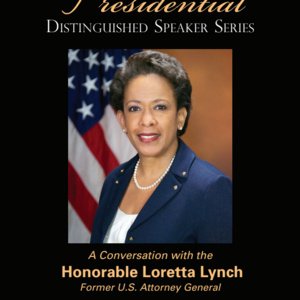 While in private practice, Lynch served as a volunteer legal advisor for the International Criminal Tribunal for Rwanda, established to prosecute those responsible for human rights violations in the 1994 genocide in that nation.